The file linked on this page is a Adobe PDF file which makes a "table top" guide to Australian football. Perfect for bars, pubs, and your coffee table when you have friends over to introduce them to Aussie rules. Free for use so long as no fee is charged. 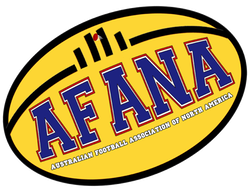 Print it out and help others learn about Australian football! Created by Paat Kelly for AFANA. Updated for 2015!